In April 2007, I wrote about one of the best late night dining experiences of my life, courtesy of Blue Ribbon Manhattan. Ever since, I've wanted to go back. When I won a Sosauce postcard contest recently, and a $50 gift certificate to the New York City restaurant of my choice, I felt like the time was right to try Blue Ribbon Sushi. I invited Michaela from Briefcase to Backpack to lunch, and as snow was starting to accumulate on the city streets, we met outside the signless entrance to a little culinary slice of Japan. 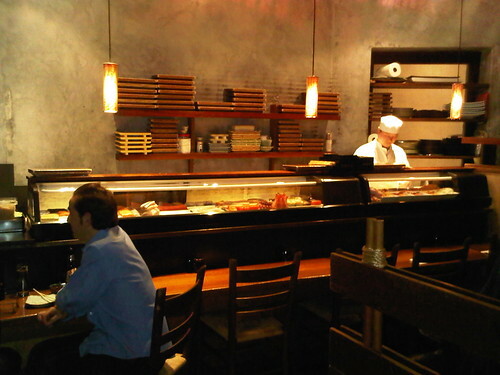 The intimate restaurant featured a sushi bar, a few small tables, and 6 booths (where we were seated). Further back beyond the booths, was a narrow hallway leading to restrooms, a table in an alcove perfect for giving a small dinner party that exclusive feel, and then extra tables in the far back. I was excited to push my sushi boundaries and try some new things. My first course included a single piece of o toro, the highest quality piece of tuna you can get, jellyfish, which I'd never tried before, and some blue crab for good measure. The $15 piece of tuna melted in my mouth, however it wasn't an Earth-shattering experience, and now that I've tasted the tender belly of a tuna, I'll be happy to return to the more moderately priced regions. The jellyfish was dipped in something, possibly soy sauce, to give it color and flavor, as I don't think it has much of either on its own. I liked it because it had the consistency and shape of gummy worms. Trust me, nothing to be afraid of with jellyfish (at least not the kind I ate). And the crab was crab. I enjoyed having it nicely presented to me, sans claws and shell. Of course 3 pieces of sashimi are hardly enough to fill one's stomach, so Michaela was kind enough to share her California and tuna rolls with me as we talked about the business of blogging. Meanwhile, I ordered a few more items, and drank about a dozen cups of green tea (they were very on-point about refilling my cup, which was a nice way to keep warm given the snow and cold weather outside). 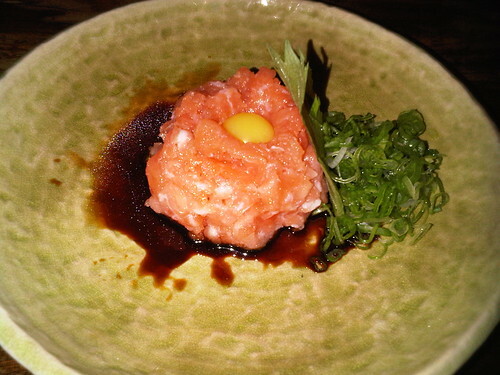 My next dish was an appetizer of salmon tartare with a quail egg, scallions, and soy sauce. I mixed it all together with the chopsticks, and it turned out to be quite a lot more than it seemed at first. I was starting to feel full, but there was still room for more. I believe I ordered the tuna with avocado, but when smoked salmon and shiso (a green leafy herb) arrived, I didn't feel the need to send it back. The shiso was nicely tucked inside the rice, and it provided a freshness in each bite, kind of like eating a breath mint. Our lunch easily lasted 2 hours, and I never felt rushed, which earns the restaurant bonus points in my book. 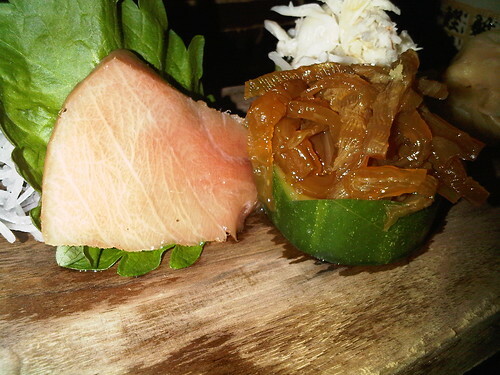 The quality of food was excellent, the service was solid, and the atmosphere was perfect. This looks delicious and is going to make my sandwich look pretty unappealing at lunch today. At least I had two bananas already. 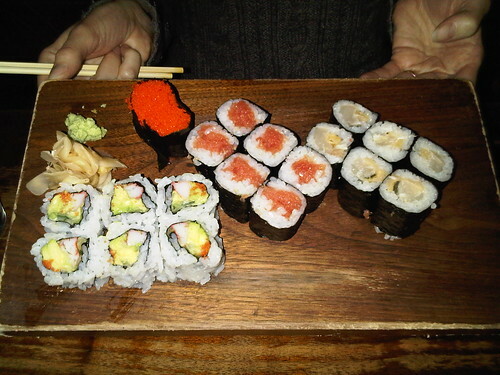 Sushi is one of our favorite foods and NYC, as you know, has plenty of excellent sushi places to choose from. We will have to remember to visit the Blue Ribbon when we return to NYC. Thanks for the review Dave. How was the egg? I have never had that. 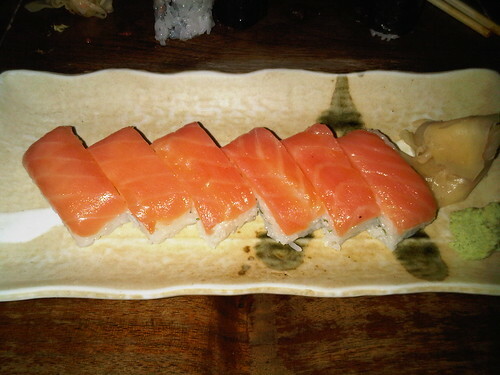 I love sushi and now I am really hungry!